With the primary focus on seeing the famous big cat, “Tiger” in its natural habitat, this trip will also give you an opportunity to appreciate other diverse flora and fauna of the country and explore its wilderness at its best in the most popular national parks of the country. From rich historic backdrop of fort in Ranthambore to pristine ravines of Chambal, from caves of Bandhavgarh to scenic meadows of Kanha, you will also get a chance to see and photograph some rare endangered species of birds and animals in the wild along with unique topography of each region. The jouney will get complete with an added gem of India “The Taj Mahal”, one of the seven wonders of the world. Grade: Medium. This is a wildlife trip based on mammal (especially Tiger) and bird watching in open top jeeps and limited walking sometimes climbing stairs for forts and other archaeological monuments. Focus Birds: Vultures (long-billed vulture, Egyptian vulture, red-headed vulture), painted spurfowl, Indian skimmer, Indian courser, painted spurfowl, sarus crane, bar-headed goose, quails, larks, cuckoos. Welcome! Our representative will meet you on your arrival at Indira Gandhi International Airport in Delhi. Proceed for a stay in hotel, situated between Airport and Railway Station. Relax during the day / or sightseeing. Board train for Sawai Madhopur in afternoon or evening (closest station to Ranthambore). After check-in at resort you can opt to relax or use facilities at resort like Ayurvedic Massage, Steam, swimming pool (depending on the in-house facilities). In the evening, attend cultural program at resort with sumptuous dinner. Overnight at resort in Ranthambore. In these two days you will be doing four jungle safaris by open gypsy/canter at Ranthambore National Park. Overnights at resort in Ranthambore. In morning, leave from resort to visit Ranthambore Fort and rural village. Come back to the resort and rest. After freshening up and lunch, leave for evening safari. Overnight at resort in Ranthambore. Ranthambore Fort – Built in 944 AD, the Ranthambore Fort is a massive fort situated on top of a hill. The fort lies between the Vindhya Plateau and Aravali Hills and is about 700 ft. high from the surrounding area. 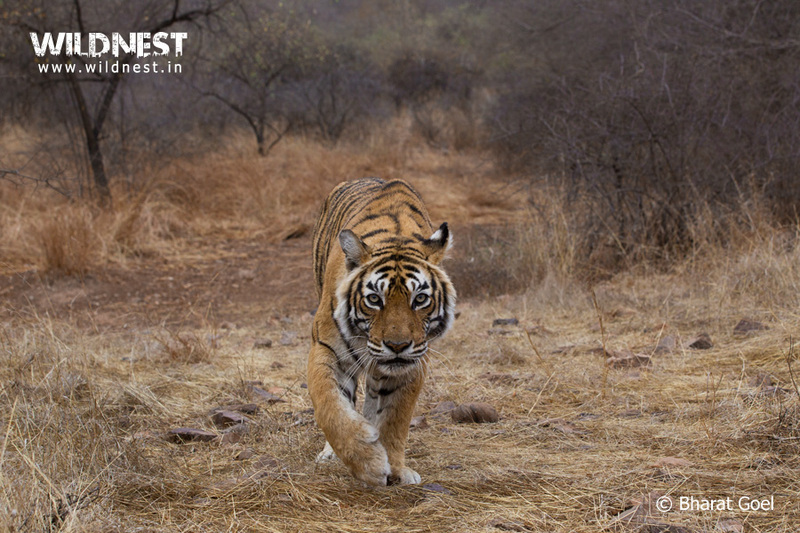 Ranthambore Fort is a must visit and you would definitely enjoy everything this historic monument has to offer. Village Visit – Sawai Madhopur and Ranthambore have clusters of local villages that can be visited You can learn about the lives of the locales who have preserved their traditions till date, without getting carried away by the city buzz. After Breakfast in Ranthambore, Check out from the resort and take a train (Janshatabdi Express) from Sawai Madhopur (10 kms away from Ranthambore) to Bharatpur (Closest station to Keoladeo Ghana National Park). After checking in at resort and freshening up, head for a nature walk in Keoladeo Ghana. 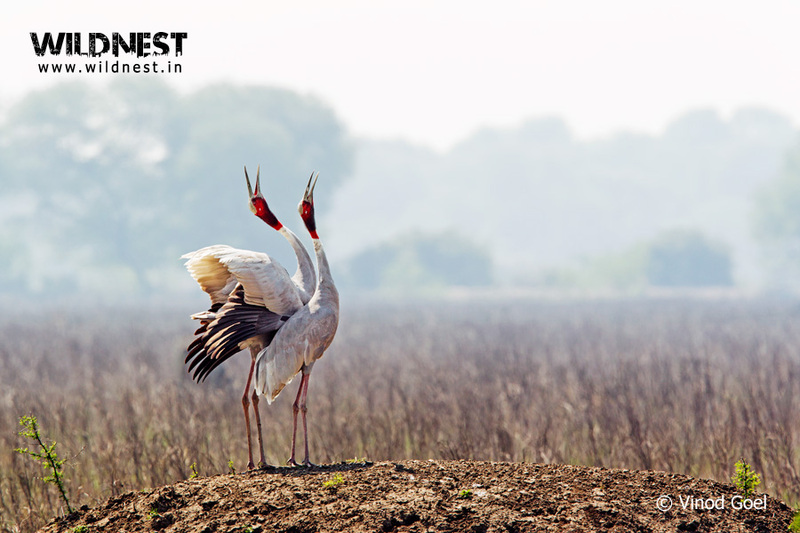 Keoladeo Ghana National Park or Bharatpur Bird Sanctuary as it was previously known, is heaven for bird watchers. Migratory birds are found in huge numbers here due to Keoladeo’s strategic position on the North-South avian route of India. During the hibernal season, the trees are over flowing with nests. A tree is observed to house up to fifty nests belonging to different species of birds. The park is also a UNESCO World Heritage Site owing to its incredible biodiversity. Apart from 375 species of birds, the park also has a rich assortment of floral species – nearly 380 of them. The aquatic diversity too, is excellent. This is an important aspect of the sanctuary as the fish population is crucial to maintaining a steady food source for the birds. Reptiles and amphibians are aplenty. After breakfast, leave for National Chambal Sanctuary by taxi ( three hours drive). You can also see lots of bird on the route. Check-in at the lodge and have lunch. In the late afternoon, You can go for a three hour Boat Safari that offers good opportunities for the sighting of Gharial, Dolphins and various species of water and shore birds with a spectacular backdrop, adding to the photography experience. After an enthralling day, return to resort. With a rich history dating back to many eras, Chambal has a lot to offer for everyone, be it the intimidating wildlife and exquisite landscapes, ancient forts and ruins, sacred temples and enthralling mythology or the renowned exploits. National Chambal Sanctuary, is a 5,400 km2 located on the Chambal River is a tri-state protected area of Rajasthan, Madhya Pradesh and Uttar Pradesh in Northern India. 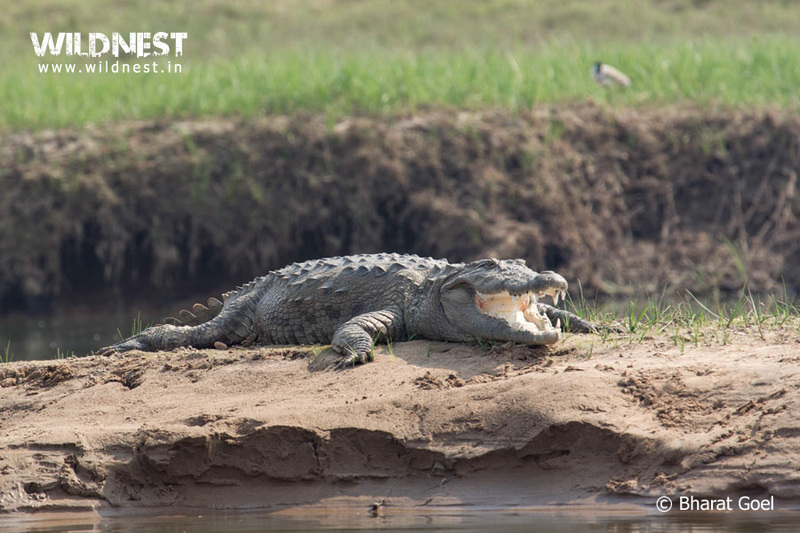 It is home to critically endangered Gharial, the Red-crowned roof turtle and the Ganges river dolphin. The landscape comprises of the Chambal River crisscrossing through ravines and hills with many sandy beaches. The ravines of Chambal enveloping around 1 – 6 kms on both the sides of the river are formed by continuous soil erosion due to floods and rains. They form an implausible maze of entwining cliffs of mud with dry scrub forest, which is home to various species of mammals, reptiles and birds. Apart from Boat Safari at Chambal River, one can indulge in other activities as well. Birding in resort campus is amazing. Go for Blackbuck jeep safari and Sarus Crane Wetland jeep safari, which are really amazing. One can also take two to three hour escorted cycling tour throught rural countryside with stop-over local village. If someone is interested in more culture and heritage, then they have Camel Safari: which takes you through ravines to Fort Ater & back. 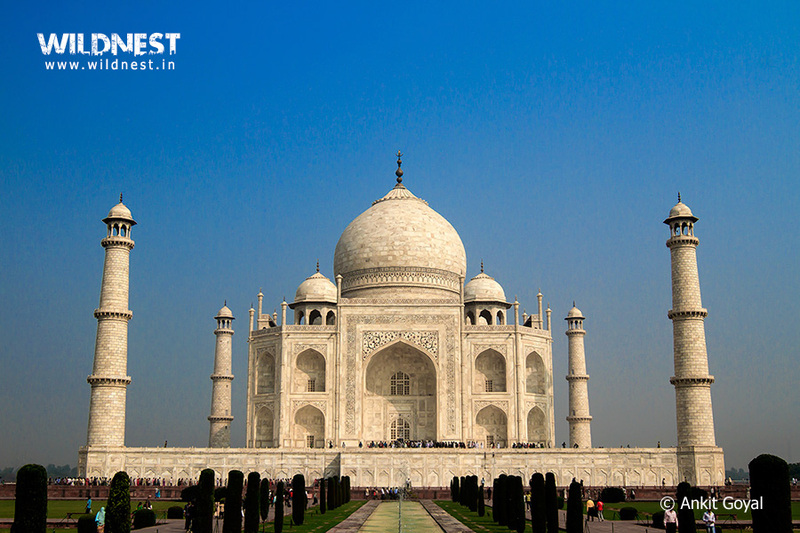 After enthralling days of wildlife adventure, proceed to see another wonder of the world, the Taj Mahal. After breakfast, check out and drive to Agra (One and half hour drive ). it’s time to explore the world famous Taj Mahal. Our guide will guide you to choose a place for your lunch as per your preferred cuisine, After lunch, you can visit another gem in the city, Agra fort or you also have the option to shop some of the finest handicrafts made in India in the local baazar(market). After early dinner/packed meal depart for Katni by overnight train Nizamuddin Jabalpur Superfast Express (Train no . 22182) at 2058 hours. Overnight in train. Reach Katni at 0705 hours in the morning and drive to Bandhavgarh National Park ( 100 kms – approx. 2.5 hours). After check in at the resort and lunch, relax at resort. Overnight at resort in Bandhavgarh. Early morning and afternoon game drives (Safaris) in Bandhavgarh National Park.You will be doing four safaris in these two days. Overnight stay at resort in Bandhavgarh.Bandhavgarh is one of the most popular national parks and the best-known Tiger Reserve in India. Apart from high density of tigers, this forest is blessed with varied landscape encircled by cliffs and wooded Vindhya mountains, grasslands, densely packed bushes and trees, forts and caves which form the iconic attraction. The beautiful sceneries of this Indian Wildlife Park offer picturesque view. Set in rugged terrain with many hills, the forested area is interspersed with savanna like areas known as Chaurs (grasslands). Some tigers such as Sita, Mohini, Charger, B1, B2, B3 and Challenger have become famous throughout the world and attained a celebrity status. Apart from various denizens and varied flora of the forest, Bandhavgarh is famous for its rich history.The history of Bandhavgarh National Park can be traced back to the 1st century. There are 39 caves in the Bandhavgarh fort and in the surrounding hillocks up to a radius of about 5 km. Bandhavgarh fort is thought to be more than 2000 years old and houses the 10th century rock images of incarnations of Vishnu. 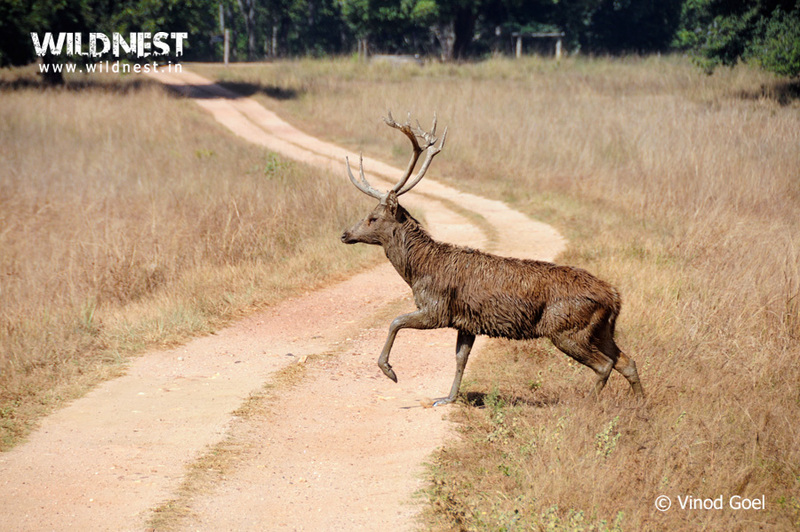 Before becoming a national park in 1968, this forest was a game reserve maintained by Maharaja of Rewa and was used as hunting grounds for Maharaja and his guests. 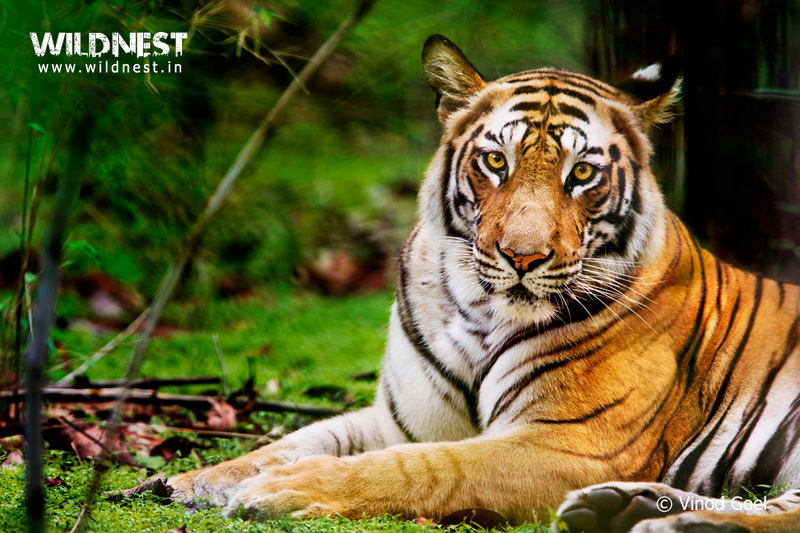 Although it is best known for its tigers, Bandhavgarh is also home to 37 species of mammals, including leopard, chital (spotted deer), sambar deer, nilgai, wild boar, chinkara, sloth bear, rhesus macaque, grey langur, jungle cat, hyena, porcupine, jackal, fox and wild dog. It is also a birdwatcher’s paradise, with more than 250 types of birds and 70 different butterflies. In morning, have breakfast and leave for Kanha ( 290 kms- approx. 6 hours) , your last destination of the trip. On the way, you can visit Ghughua Fossil Park, to see fossils, some of which date back to 65 million years ago. Check in at the resort at Mukki range of the park. Overnight at resort in Kanha. Morning and evening safaris on both days in the park. Kanha National Park, the inspiration behind Rudyard Kipling’s unforgettable classic Jungle Book, offers magnanimous sightseeing experiences for the nature lovers. Overnight at resort in Kanha.The tropical central highlands of this park make a perfect habitat for the splendors of wild animals including the majestic tigers, wild dogs to countless species of plants, birds, reptiles and insects. However, if one animal species were to represent Kanha, it would probably be the Barasingha (Southern Swamp Deer) also known as “the Jewel of Kanha”. Barasinghas at Kanha are unique and are found in abundance here. Diverse landscapes consists of the meadows that are basically open grasslands that have sprung up in fields of abandoned villages, evacuated to make way for the animals, lush forests of sal and bamboo, plateaus and meandering streams. Kisli, Kanha, Sarhi and Mukki in the western block; and Bhaisanghat and Supkhar in the eastern sector which are closed for the public. This park has been the hub for the researchers and conservationists for over a century. The Kanha Park became the perfect location for Stanley Breeden and Belinda Wright’s award winning National Geographic Film, “Land of the Tigers” in 1980. Although all the drivers, guides and naturalists try their best to track the tiger but cannot assure you of a sighting. One should understand tigers are shy animals and rare to spot in the vast jungles. But one should not be disappointed and appreciate all other inhabitants, as they are an equally important part of the ecosystem. It’s time to say goodbye to the wild friends. Check out by 0730 hrs, drive to Bhedaghat (220 kms – 4.5 hours), visit Bhedaghat for waterfall and marble rocks, have lunch at Bhedaghat / Jabalpur. Take a flight to Delhi. Reach Delhi and depart for your country. Bhedaghat – 20 kms from Jabalpur.It’s most famous sights are the Dhuandhar Falls, Marble Rocks, and the Chaunsath Yogini temple. Chaunsath (64) Yogini – Dedicated to goddess Durga, this 10th century temple is one of the four major extant temples containing carvings of sixty four yogini, female yoga mystics. Situated on a hill, it offers a remarkable view of the whole area around with the river flowing through the marble rocks. Marble Rocks – The perpendicular magnesium limestone rocks rising up to a hundred feet on either side of river Narmada offer a spectacular view. Boating facilities are available between November-May. Visiting this place on full moon night is a magical experience when the whole stretch of water is transformed into a sheet of liquid silver. Dhuandhar Falls – It is one of the most stunning waterfalls. Formed on river Narmada, it resembles the smoke coming out of the river and hence got it’s name as “Dhuan (smoke)-dhar (flow of water)”. Bandhavgarh and Kanha National Park remain closed to public access on Wednesdays afternoons. So if we plan in such a way that 10th day of this itinerary is Wednesday, then that time can be utilized for travelling from Bandhavgarh to Kanha. In case we can’t avoid it, we can help you plan the evening in the other best possible manner. There can be a change in order of activities (jungle safari, nature walk, village visit etc)at the time of operation due to any unforeseen reason. Hence above itinerary is for your reference and all the activities which are mentioned above, will be conducted during the trip. Above itinerary can be changed at the time of operation due to any unforeseen reason, keeping the best interest for travelers, however all the services possible that time will be provided according to the situation. As the Forest Department can cancel / change safari booking at any point of time. Safari Timings and duration will differ according to different seasons and destination. For eg. In peak summers (May-June) morning jeep safari in park starts at 6 am – 9:30 am and in same in autumns timings will be 6:30 am – 10 am and in peak winters 7 am – 10:30 am. Similarly evening safari timings will also be different. Duration of safari also differs in different parks. For eg. In Ranthambore morning and evening safari is of 3 hours 30 mins and in Kanha National Park morning safari is of 4 hrs 30 mins and evening safari is of 3 hrs. As mentioned above, currently this itinerary is focusing more on mammals in tiger parks (i.e. Ranthambore, Bandhavgarh and Kanha) and on birds at Keoladeo Ghana and Chambal. If you want focus more on bird watching keeping the same itinerary then do let us know and we will provide a birding naturalist to accompany during jeep safaris. Travel Guide: A full list of our suggested items to pack is included in the pre-departure guidebook that we will be mailing to you after the confirmation of your booking.